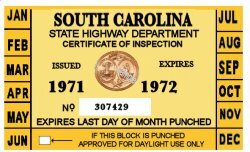 1971-72 South Carolina INSPECTION Sticker - $20.00 : Bob Hoyts Classic Inspection Stickers, Add a Final Touch to your Restoration! This 1971-72 South Carolina sticker was carefully restored both front and back keeping true in color and size to the original. It has a modern "Peel and stick" feature to allow you to adhere it to the inside of your windshield, just like the original. It has been UV treated to protect against fading. We will pay $25. any original sticker in readable condition that do not appear on this site. We will return to you a restored reproduced sticker. This sticker can be ordered with your own antique license plate number appearing where the serial number now appears for an additional $10.